Increasing production by investing in agricultural sector, tourism, and industrial as well as small/medium scale businesses. Building infrastructures for energy resources, road and aerial transportation, information & communications, rural urban connection and tripartite agreements between Nepal India and China. High and sustainable human development by giving importance to social development, social conservation and social security. Economic, social and governmental improvement, safe and dependable public funds, clean, transparent and friendly public services, and human rights conservation. Increase gender equality, inclusiveness, environmental conservation, use of science and technology, etc. 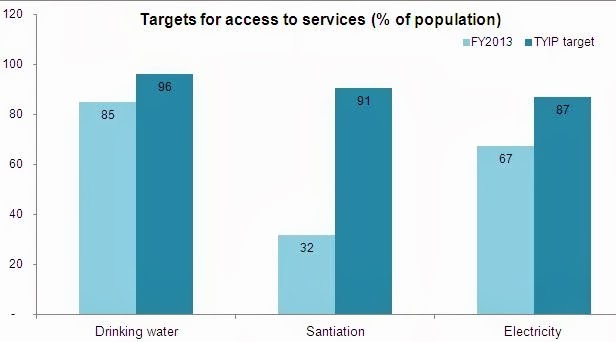 Rapid economic growth rate and immediate poverty reduction through fair distribution of resources. Considerable improvement of human development and the development of overall economical prosperity and sustainable economic development. The reduction in disparity in the economic growth of the Nepalese society and establishment of Nepal as a social justice-based equitable and welfare state. Expansion of economic sector, maximum utilization of rural masses, and decentralization of industries and adequate employment opportunities. Make the country competitive and business oriented by making sustainable agricultural changes. Solving the energy crisis, minimizing dangers of outbreaks and economic disasters, efforts to adapt to the global climate change. Construction, development, and restructuring of infrastructures to connect rural and urban development programs, and make it an aspect in economic development. Making development programs, integrated work programs, and demographic development effective to provide services to the public. Increasing efficiency in regional and local level development to make clean and effective administrations. The work of reconstruction of the state to be completed by the regional and local development leaders and given to the elected representatives, and strengthening the national planning implementation system. After Nepal's constitution was issued, it solved the political problems and Nepal entered into social and economic development. There is immense possibility for economic development if we can properly utilize fertile grounds, water resources, forests, minerals, biological diversity and geographical beauty, as well as other natural resources. More people are getting economically active, and with more skilled manpower getting trained and educated, it helps in the social and economic development of the society. The use of physical and other basic infrastructures that were previously unused are being put into use . The highest return can be gotten from the social and economic sector investments. Over half of the financially active public has been integrated public co-operative and community systems. Cooperative and private sectors have the opportunity to prosper financially by the government's fiscal policy and help in making the government prosperous. 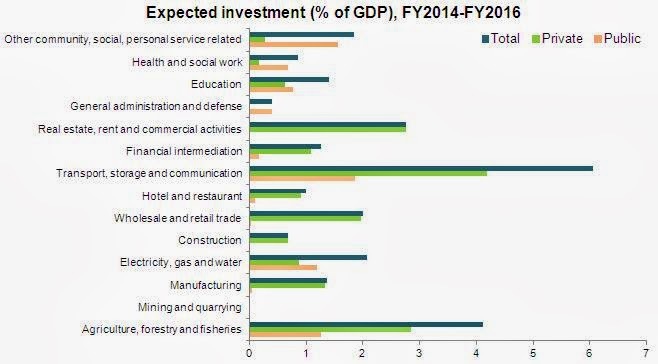 Non-resident Nepalese are investing in Nepal more than ever. The rapid expansion in the middle class population in neighbor countries has increased opportunities to expand tourism, increase foreign investment, export and certain services sectors in Nepal. Skills learned by Nepalese citizens in foreign employments are used in enterprises and entrepreneurship, knowledge, technology and other operational opportunities in Nepal. The first five-year plan named Papatileka was implemented by USSR in 1928 A.D. setting record in the world history. 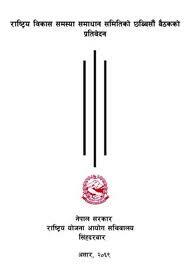 The then Rana Prime Minister Juddha Shamsher, of Nepal, had announced 20 years paper plan which was unimplemented. So, at last, planning commission was established on Poush 20, 2013 B.S. 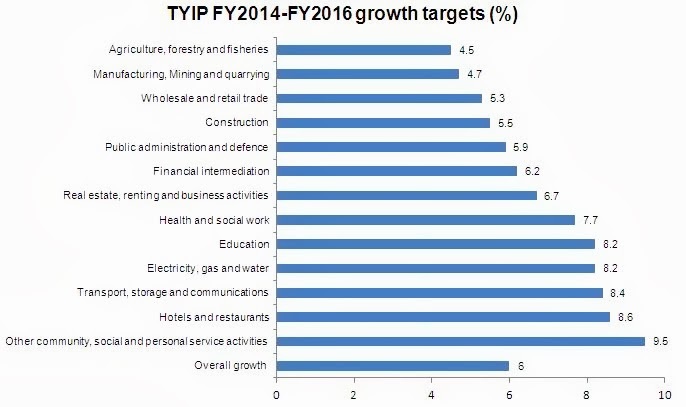 which introduced the first five-year plan (2013-2018) in Nepal. a ) to provide an opportunity for all people to raise their living standard. b) to increase production and increase employment opportunities. c) to conduct development programs by establishing organizations. d) to do necessary economic survey and planning in future by creating the foundation. The expenditure of the plan was estimated about 33 crores but only 21 crore and 44 lakhs was spent. 2.2 crore from the internal sources and 19 crores 24 lakhs from the external sources were spent during that period. Top priority was given to transport and communication, second to agriculture and rural development and third to electricity and irrigation by the plan. c) to create employment opportunities. d) equal distribution of production. It was estimated that the plan would spend 60 crores but only 59 crore and 68 lakhs and thirteen thousand was spent. Transport, communication, and electricity were given first priority and industry and tourism second and third priority were given to social service by the plan. a to increase foods production. b) to improve agricultural sector. c) to develop infrastructure, industrial and foreign trade. d) to eradicate social inequality. It was estimated that the plan would spend about 2 arabas 50 crores but only one araba and 77 crore 65 thousand rupees was spent. The plan had given first priority to transport, communication, electricity, second to agriculture and rural development and third priority was given to industries and mines. There are ten fiscal planning in Nepal. In the first five-year plan, the top priority was given to transport and communication, second to agriculture and rural development and third to electricity and irrigation by the plan. In the second three-year plan, the top priority was given to transport, communication, and electricity. Third five-year plan had given first priority to transport, communication, electricity, second to agriculture and rural development and third priority was given to industries and mines. Transport and communication were given first priority, industry, commerce and mine were given second priority and agriculture was provided with third priority by the fourth plan. Transport and communication were given first priority by the fifth five-year plan. The first priority was given to agriculture, irrigation, and forest by the sixth plan. The seventh five-year plan had given first priority in the sectors of agriculture, irrigation and forest. The seventh five-year plan had given first priority in the sectors of agriculture, irrigation and forest by the ninth plan. What were the chief objective of first five year plan (1955-1961 AD)? a ) to provide opportunity for all people to raise their living standard. d) to do necessary economic survey and planning in future by creating foundation. What were the chief objective third five year plan (1965-1970 AD)? a) to increase foods production. b) to improve agricultural sector. c) to develop infrastructure, industrial and foreign trade. d) to eradicate social inequality. Which one of them is not the chief objective of first five year plan? To decrease production and increase employment opportunities. To do necessary economic survey and planning in future by creating foundation. To conduct development programs by establishing organizations. Which one of them is not the chief objective of second five year plan? Which one of them was not a major vision of three year fiscal plan? Changing Nepal from a well developed country into a developing nation within 20 years. Ensuring equal opportunities to all the Nepalese people in all sectors. Developing Nepal in the state of prosperous modern Nepal. Raising the living standard of Nepalese people decreasing the poverty at minimum level through various activities based on economic growth. Any Questions on 'Fiscal plan '?